Fineness is one of the most important proprieties of the fibres that are made into textile products. Cotton fineness can be defined in various ways: perimeter, diameter, area of cross section, mass per unit length, or surface area. Coefficient of Variation of Diameter (%). The Diameter Distribution Histogram (% of fibres in 1-micron class intervals). Mean Fibre Diameter is measured by Laserscan. Results are reported as micrometers (microns). The organic card sliver snippets fall into the Laserscan and are automatically mixed into a solution within the instrument. Prepared fibre snippets are automatically dispersed in a carrier liquid that transports them through the measurement cell. In the cell, fibres intercept the laser beam and changes in the beam intensity are converted to diameter readings by the computer. In a parallel optoelectronic processing circuit the validity of each reading is confirmed by the fibre-optic discriminator. After measurement, the fibres are caught in a cloth filter for subsequent removal. Each snippet is only measured once. Each sample is only measured one time. . Also the Coefficient of Variation of Fibre Diameter can be calculated. In addition, for appraisal purposes, the Certificate can show the Mean Curvature of the fibres in the sample and the Comfort Factor of the sample. 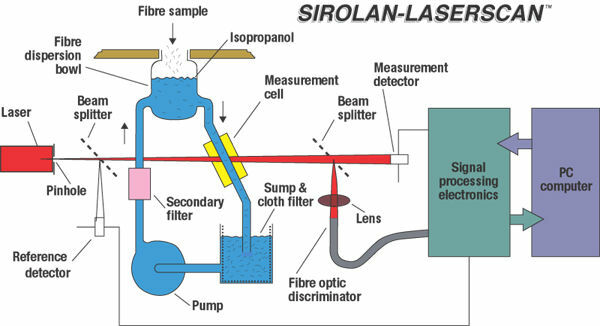 Fig 3.1 The Schematic Diagram of the Lasercan Machine. The (Fig. 3.1) shows how a Laserscan works. Fibre snippets are dispersed into isopropanol-water mixture and the resultant suspension then flows through a measurement cell. As they pass through the cell the fibre snippets intersect a thin beam of light generated by a laser. This beam is directed at a measurement detector. The detector produces an electrical signal that is proportional to the amount of light incident upon it. Therefore, when a fibre snippet passes through the beam this electrical signal is reduced by an amount that is directly proportional to the projected area and therefore thickness or diameter of the fibre. The relationship between the magnitude of this decrease and Mean Fibre Diameter is determined by calibrating the instrument using card sliver where the Mean Fibre Diameter and Diameter Distribution have already been determined by direct measurement using the Projection Microscope. After fineness, length is the most important property of a fibre. In general a longer average fibre length is to be preferred because it confers a number of advantages. The quality of the fibre of cotton depends on its fineness, purity, shine, and colour and especially of the length of the fibre (yard). As much as greater is the length of the fibre (It is to oscillating between 10 and 50 mm) the yard is finer, more resistant and more regular. The long fibre cotton o is more expensive than that of short and average fibre. An object only it is seen with its own colour if is illuminated with white light or with light of its same colour. Color measurements were made using a Spectrocolorimeter SF-600 Plus colorimeter from Datacolor International. The spectrocolorimeter analyzes light energy reflected or transmitted by a sample, wavelength by wavelength. The photometric characteristics of a material are measured in the visible spectrum, and spectral graphs are produced. In physical terms, the color of an object is measured and represented by its spectrophotometric curve. This is a graph representing the reflected or transmitted part of incident energy as a function of the wavelength, in the visible spectrum between 400 and 700 nm. For example, if all of the wavelengths are absorbed, the color is perceived as black, whereas if all wavelengths are fully reflected (100%), white is perceived. Fig 3.2 A graph of the visible spectrum of light is shown below with wavelengths expressed in nm. The tests had been made with the card sliver of Naturally Coloured Cotton. For problem with the raw material all the experiments only had been calculate one time. The colour to exanimate it is the naturally coloured cotton. The great different of this colour with respect another is the way to obtain them. This colour grows in the same plant by biological method. Nowadays only there are two varieties of colour, brown and green with its different tonalities. With these analysis intends to show the viability of the organic cotton with respect al conventional cotton and there is another way. The test assesses both the colour change in a sample and cross-staining into multi-fibre fabric in a standard wash. The test conditions it is governed by the standard “UNE-EN 2015-C01”. The Standard determines the concentration necessary of soap, time of the bath and temperature. The tested samples are graded with the use of Grey Scales. - Multi-fibre Fibre tests: Sufficient to cut specimens 40 x 100mm. This fabric was formed with different types of natural a synthetic fabric; wool, acrylic, polyester, nylon (6.6), cotton and acetate, in accordance with “ISO 105-F10” standards. The card sliver is deposited between two multi-fibre fabrics and it sews by for the four sides. It is prepared the stock solution, 5g of soap for each litre of water. The machine to use is type Mathis. It is deposited the sample in one bowl with 200 ml of solution with a temperature of 40 C ± 2o C. The sample will be 30 minutes in contact with the solution in a constant rotation. Spend this time it is dry the sample to ambient temperature and after it are graded with the use of Grey Scales. In agreement with the standard “UNE IN 2015- C01”, when the sample is dry, it is valuating different colour in the sliver and the multi-fibre fabric too with respect the original sample. Multi-fibre fabric: Grey scales for assessing staining, which met with standard “ISO. 105. A03”. The test assesses both the colour change in a sample and cross-staining into multi-fibre fabric in a standard wash with sodium Chloride. The test conditions it is governed by the standard “UNE-EN 2015- C03”. The Standard determines the concentration necessary of soap, concentration of bath, time of the bath, temperature and the quantity of Sodium Chloride (Na Cl). The tested samples are graded with the use of Grey Scales. The card sliver is deposited between two multi-fibre fabrics and it sews by for the four sides. It is prepared the stock solution; 5g of soap for each litre of water more 2g Sodium Chloride. The machine to use is type Mathis. It is deposited the sample in one bowl with 200 ml of solution with a temperature of 95o C ± 2o C. The sample will be 30 to 240 minutes in contact with the solution in a constant rotation. Spend this time it is dry the sample to ambient temperature and after it are graded with the use of Grey Scales. In agreement with the standard “UNE-EN 2015- C03”, when the sample is dry, it is valuating different colour in the sliver and the multi-fibre fabric too with respect the original sample. The test assesses both the colour change in a sample and cross-staining into multi-fibre fabric in a standard wash with sodium carbonate. The test conditions it is governed by the standard “UNE-EN 105 E06”. The Standard determines the concentration of bath, time of the bath, temperature, the quantity of sodium carbonate (Na 2 CO3), and Sodium Hydroxide (Na OH) for obtain a pH= 8 level , recommended for this test.. The tested samples are graded with the use of Grey Scales. The card sliver is deposited between two multi-fibre fabrics and it sews by for the four sides. It is prepared the stock solution; 100g sodium carbonate (Na 2 CO3) in each litre of waters. The machine to use is type Mathis. It is deposited the sample in one bowl with 200 ml of solution with a temperature of 40o C ± 2o C. The sample will be 30 minutes in contact with the solution in a constant rotation. Spend this time it is dry the sample to ambient temperature and after it are graded with the use of Grey Scales. In agreement with the standard “UNE-EN 105 E06”.when the sample is dry, it is valuating different colour in the sliver and the multi-fibre fabric too with respect the original sample. The test assesses both the colour change in a sample and cross-staining into multi-fibre fabric in a standard wash with sodium carbonate. The test conditions it is governed by the standard “UNE-EN 105 E05”. The Standard determines the concentration of bath, time of the bath, the quantity and concentration of Acetic Acid (CH3COOH), and Sodium Hydroxide (Na OH) for obtain the exactly pH= 5 level , recommended for this test. The tested samples are graded with the use of Grey Scales. The card sliver is deposited between two multi-fibre fabrics and it sews by for the four sides. It is prepared the stock solution; 50g of Acetic Acid (CH3COOH) in each litre of waters and Sodium Hydroxide (Na OH) for obtain a pH= 5. The machine to use is type Mathis. It is deposited the sample in one bowl with 200 ml of solution with a temperature of 37o C ± 2o C. The sample will be 30 minutes in contact with the solution in a constant rotation. Spend this time it is dry the sample to ambient temperature and after it are graded with the use of Grey Scales. In agreement with the standard “UNE-EN 105 E05”.when the sample is dry, it is valuating different colour in the sliver and the multi-fibre fabric too with respect the original sample. The test assesses both the colour change in a sample and cross-staining into multi-fibre fabric in a standard wash with . The test conditions it is governed by the standard “UNE-EN ISO 105 E03”. The Standard determines the concentration of bath, time of the bath, temperature, the quantity of; Chlorine (Cl), Sodium Chloride (Na Cl), Sodium Carbonate(Na2CO3), Iron (Fe) and Sodium Hydroxide (Na OH) for obtain the a pH= 7,5± 0,05level recommended for this test. The tested samples are graded with the use of Grey Scales. - 120g to 170g of Sodium Chloride (Na Cl)/ 1litre of water. - 20g of Sodium Carbonate (Na2CO3) /1litre of water. - 0, 01g of Iron (Fe)/1litre of water maxim. The card sliver is deposited between two multi-fibre fabrics and it sews by for the four sides. It is prepared the stock solution; - 40g to 60g of Chorine (Cl), 120g to 170g of Sodium Chloride (Na Cl), 20g of Sodium Carbonate(Na2CO3) and 0,01g of Iron (Fe), in each litre of waters and Sodium Hydroxide (Na OH) for obtain a pH= 7,5± 0,05The machine to use is type Mathis. It is deposited the sample in one bowl with 200 ml of solution with a temperature of 27o C ± 2o C. The sample will be 60 minutes in contact with the solution in a constant rotation. Spend this time it is dry the sample to ambient temperature and after it are graded with the use of Grey Scales. The test assesses both the colour change in a sample and cross-staining into multi-fibre fabric in a standard wash with sodium chloride. The test conditions it is governed by the standard “UNE-EN ISO 105 E02”. The Standard determines the concentration of bath, time of the bath, temperature and the dissolution of Sodium Chloride (Na Cl). The tested samples are graded with the use of Grey Scales. The card sliver is deposited between two multi-fibre fabrics and it sews by for the four sides. It is prepared the stock solution; 30g Sodium Chloride (Na Cl) in each litre of waters and Sodium Hydroxide (Na OH) for obtain a pH= 3,5± 0,05. The machine to use is type Mathis. It is deposited the sample in one bowl with 200 ml of solution with a temperature of 37o C ± 2o C. The sample will be four hours in contact with the solution in a constant rotation. Spend this time it is dry the sample to ambient temperature and after it are graded with the use of Grey Scales. In agreement with the standard “UNE-EN 105 E02”.when the sample is dry, it is valuating different colour in the sliver and the multi-fibre fabric too with respect the original sample. The test assesses both the colour change in a sample and cross-staining into multi-fibre fabric in a standard wash with sodium chlorite. The test conditions it is governed by the standard “UNE-EN ISO 105 N02”. The Standard determines the concentration of bath, time of the bath, temperature, the quantity of; Sodium Thiosulfate (Na2O3S2), Sodium Chlorite (NaClO2), and Acetic Acid (CH3COOH), for obtain the pH= 3,5, recommended for this test. The exact concentration of sodium chlorite is determined by valuation with cradle solution of sodium thiosulfate. The card sliver is deposited between two multi-fibre fabrics and it sews by for the four sides. It is prepared the stock solution; 30g of Sodium Chlorite (NaClO2), and Acetic Acid (CH3COOH) for obtain a pH= 3,5± 0,05. The machine to use is type Mathis. It is deposited the sample in one bowl with 200 ml of solution with a temperature of 80o C ± 2o C. The sample will be 60 minutes in contact with the solution in a constant rotation. Spend this time it is dry the sample to ambient temperature and after it are graded with the use of Grey Scales. In agreement with the standard “UNE-EN ISO 105 N02”when the sample is dry, it is valuating different colour in the sliver and the multi-fibre fabric too with respect the original sample. One of the primary uses of a spectrophotometer is to determine the concentration of a solution. The spectrophotometer shines light at a set color (wavelength) through a sample and the machine determines the percent that the light is absorbed by the sample. By comparing this amount to a graph of known concentrations, the concentration of an unknown solution can be determined. 1. Determine the color of light that is absorbed the most by the solution. Often this wavelength is given. You change the color (wavelength) of light shining through a concentrated sample of the solution material and graph the absorbance. 2. Make known concentrations of the substance to be tested. For example: 20%, 40% etc. Set the spectrophotometer to the wavelength determined in step 1 and measure the absorbance of each known solution and graph absorbance vs. concentration. 3. Measure the absorbance of the unknown and determine the concentration from the graph in step 2.